Communities are becoming increasingly dog-friendly throughout the country, from hotels accommodating travelers to apartments with dog-friendly amenities. SYNLawn of Northeast Ohio is extremely excited to announce that they’ve been chosen to be a part of the largest synthetic grass dog park Ohio. 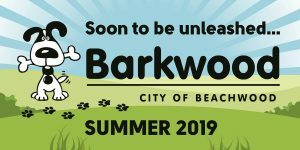 Construction on Barkwood has begun in Beachwood, which is 16,000 square feet of pet-friendly synthetic grass with doggie drinking fountains, furniture, and so much more to give pets new encounters. This maintenance-free grass is available for homeowners as well so that pet lovers in Cuyahoga County and beyond can take advantage of the benefits of artificial turf even on their own property. Whether regarding maintenance of a location that satisfies hundreds of pets or a single pet, the caretakers won’t have to worry about urine turning spots of the lawn brown or filling holes that a digger likes to create. This artificial lawn offers optimal drainage from rain, urine, or any other liquid at a rate of 30-inches per hour. Without standing water, dogs can play on it immediately after it rains, and people won’t have to worry about mud being tracked into their car after playing at Barkwood. One of the best benefits is also that it helps prevent the spread of disease and pests since it’s an environment free of fleas and ticks, as well as organic zeolite crystals that reduce 80% of the odors caused by the ammonia in pet waste. After discovering how wonderful Barkwood is for their pets, every homeowner will want it installed on their property. Every homeowner with a pet from New Philadelphia to Cleveland loves the prospect of a beautiful yard but feels that it may seem too good to be true. SYNLawn of Northeast Ohio not only offers a wide selection of commercial, but also residential artificial grass options. When considering what is best for one’s dog, they must consider a variety of factors — including the pet’s size, the size of the area allotted to them, how much time their dog spends outdoors, and the destructiveness of their pet. With such a vast array of products from which to choose, a new maintenance-free lawn can be completely customized to each circumstance, maintaining its beauty throughout the year. Not only does this maintenance-free artificial lawn prevent indoor damage from muddy pawprints, but it also enhances curb appeal and reduces utility bills since it stays green without ever needing to be watered. One call to this Synthetic Turf Council certified installer can be the first step to turning one’s current home into their dream home. Pets bring joy and companionship to every life that they touch; however, it requires some effort to take care a home at the same time, from holes to urine spots in the yard. Homeowners from Cleveland, Ohio, to New Philadelphia, Ohio, who are looking for a way to have both a best friend and a beautiful yard can have it all with one phone call to SYNLawn of Northeast Ohio, who specializes in beautifully crafted synthetic grass that looks and feels just like the real thing. 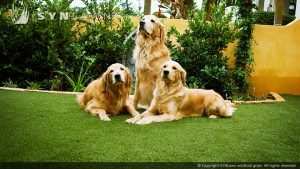 With a wide variety of artificial lawn options from which to choose, anyone can experience the joys of a maintenance-free, pet-friendly grass. This Synthetic Turf Council certified installer makes the process smooth with their expertise. 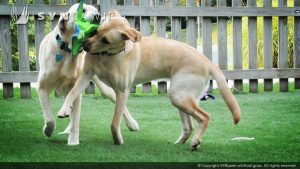 Pet lovers in Cuyahoga County, Ohio, can also take advantage of the excitement that the benefits of artificial turf give to their companions at the much-anticipated community dog park in Beachwood, Ohio, Barkwood. Anyone who wants the best commercial or residential artificial grass for their pet and themselves must consider calling SYNLawn of Northeast Ohio to make both caretaker of the lawn and destroyer of the lawn happy. This entry was posted in Animal Care, Artificial Turf, Artificial Turf, Artificial Turf, Business to Business, Home Improvement, Pets, Synthetic Grass and tagged artificial lawn Cuyahoga County Beachwood New Philadelphia Cleveland Ohio, benefits of artificial turf Cuyahoga County Beachwood New Philadelphia Cleveland Ohio, commercial artificial grass Cuyahoga County Beachwood New Philadelphia Cleveland Ohio, maintenance-free grass Cuyahoga County Beachwood New Philadelphia Cleveland Ohio, pet-friendly grass Cuyahoga County Beachwood New Philadelphia Cleveland Ohio, residential artificial grass Cuyahoga County Beachwood New Philadelphia Cleveland Ohio, SYNLawn of Northeast Ohio, synthetic grass Cuyahoga County Beachwood New Philadelphia Cleveland Ohio, synthetic turf certified installer Cuyahoga County Beachwood New Philadelphia Cleveland Ohio by admin. Bookmark the permalink.